No Crowds guest reporters, Gary and Lorraine of Trattoria dal Billy fame are at it again. This time we find them in India, as they put it, "an unlikely candidate for No Crowds." What do John and Yoko, Alfred Hitchcock, Queen Elizabeth, Roberto Rossellini and Hillary Clinton have in common? Wait for it…wait for it…yes! 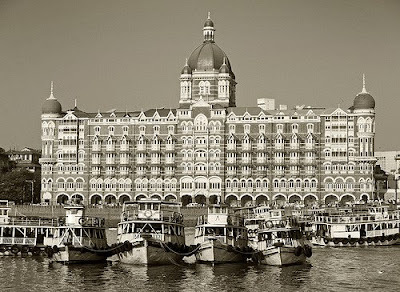 Of course, they have all been guests at the Taj Mahal Palace in Mumbai. Having opened in 1903, the hotel has had plenty of time to see its share of royalty. But how on earth could such a destination qualify for this blog? A classic hotel in a crowded city of a very crowded nation? No crowds? The answer lies in a single word: "monsoon". The common wisdom is that western and central India are to be avoided in July, when the skies open up and once again assure that this part of the world stays as green and verdant as Dubai (our current address) is brown. But Mumbaikars have a bit of a different attitude towards rain than, let's say, Londoners - they love it! As we watch from our room in the Taj's tower, people gather by the sea wall near the Gates of India, fervently hoping that the record high tides will send a wave crashing over the wall and drench them, which happens on a regular basis. Of course, they're already wet from the rain, but they laugh and cheer just the same. But I digress. The point here is, the Taj during the monsoon is two things: uncrowded and amazingly inexpensive. For something close to $200 per night on the weekend special, we were awarded a 12th floor room facing the harbour and overlooking the Gates of India. And the crowds? Well, we were the only people in the gym each morning. We were the only swimmers in the pool most mornings--a classic pool, by the way, 3 metres deep, and with two majestic lions jetting fresh water. For two days we were even the sole occupants in the outdoor Palm Lounge for breakfast. The ceiling fans, wicker and lush greenery everywhere created a wonderful alternative to the antiseptic, air conditioned breakfast buffet which, inexplicably, the other diners had unanimously chosen. 1) There is no way in the world they can make a profit in July--this is about making sure the brand's flagship property continues to deliver superior guest experiences, whatever the cost. Example: We had an average of three waiters to ourselves at most meals. 2) Regardless, they do not reduce their staff or cut back on any services in any way. Empty restaurants are open their full hours, and the pool and gym are fully attended throughout the day. Having lived in Dubai for the last year or so, we are used to "pseudo-service" - the appearance of good service which is in fact well-meaning members of the south Asian diaspora rigidly following a script laid out by an uncreative and unforgiving food and beverage manager. Plates and settings are whisked away before your last bite clears your teeth, leaving you fighting to keep your silverware for use with the next course. But it's different at the Taj. Most importantly, everyone seems to be happy. The "good morning, sir", "Good morning, ma'am" is invariably accompanied by a warm smile, a comment about the weather, or perhaps something remembered from the previous encounter--"would you like the table with the view that you enjoyed yesterday?" or "how was your visit to the museum?". Unless it's all an elaborate ruse, these people are very happy with their jobs, and they are truly glad to see you. Once, as we strolled the outdoor gallery past the pool being greeted heartily by hotel staffers standing at parade rest on either side, I had an image of how another, more famous couple might feel walking down a similar hallway--did someone just say, "good morning Mr. President"? A night at the Zodiac restaurant was a continuation of the incredible experience. If anybody knows how to cook vegetarian, it must be the chefs in this country, so we both chose the "vegetarian degustation" menu, anticipating a sampling of everything Indo-French cuisine could offer without involving animals. When the waiters carefully placed four knives and forks next to our show plates, we knew the evening would be rewarding. The succession of tastes and fusion pairings included not one, but two soufflés--truly a meal to remember. Since we had booked at the laughingly early hour of 8 pm, we had the place to ourselves for the first couple of hours. Well, to ourselves, the entire waitstaff, and a wonderful piano player who played passable smooth jazz and took requests. I know it's corny, but you really have to have "As time goes by" played some time during an evening like this. Finally, it would be hard to mention this hotel without reference to the attacks of 26/11. The Palace side of the hotel is still mostly closed, undergoing what are delicately referred to as "renovations" by the staff. Entering the hotel now involves scanners and security checks - the most I've seen this side of Riyadh. Armed security guards and police are everywhere as you enter, but then seem to fade into the shadows--I'm sure they are still there, though. But the spirit of the place is unrelentingly upbeat--nobody, they seem to be saying, is going to keep us from creating a world class experience for those of us clever enough to realize that this was the right place at the right time. A short walk from the Taj is an experience that is at the same time completely different and exactly the same - Café Leopold. Like the Taj, this establishment was also a target of the terrorists on 26/11, but with that same indomitable spirit, it reopened 2 days later, and has been open ever since. It wears its wounds proudly, with no attempt to hide them. Once we sat next to a wooden column which had two neat holes from a bullet entering and exiting, and another time in front of a shuttered window, much photographed by patrons, with every bullet hole untouched. The staff, who must have lost some colleagues that night, are clearly taking satisfaction in making this place hum the way it always has. A cross between Rick's Café in Casablanca and the alien biker bar from Star Wars, it is packed with customers of all sorts at all hours (definitely NOT a "no crowds" experience). You can see abayas, saris, turbans, All Blacks tee-shirts and LL Bean walking shorts, and there are always a couple of those fifty-something skinny American guys with grey ponytails who seem to pitch up in the far corners of the world. It serves an eclectic menu that includes hamburgers, nachos, vegetable pakoras, paneer tikka sandwiches, sweet and sour shrimp and the best garlic naan this side of, well, Mumbai. To say it's a good deal doesn't quite capture it. Let's just say that a wonderful multi-Asian meal with a pitcher of Kingfisher (that is, a yard-high column of beer with a spigot at the bottom) set us back exactly 1/20 of our tab at the Zodiac. And the good news (besides the reassuring presence of armed security at all the entrances) is that the recent nonsmoking ordinance in the country means that you can actually see from one side of the place to the other. So if you're in south Asia and looking to avoid the crowds, just remember…Monsoon Mumbai. Photo from Terra Trippers photostream on Flickr.